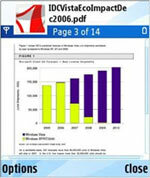 Adobe Reader LE lets you view PDF (Adobe Portable Document Format) files on the go - anytime, anywhere. Enjoy enhanced PDF viewing with faster and easier to read single column text reflow that resizes documents for greatly improved readability on the small screen. Version 2.5 is the next generation of Adobe Reader LE for mobile devices with improved performance, such as opening large files faster, and an easier, more intuitive navigation. Quickoffice is the Exclusive S60 Provider of this release. Upgrade your Adobe Reader LE today! FREE 7 day evaluation copy available. is it trial version or free version? already quick office installed in my nokia x6. I argently need this softwear for nokia x6. why is this a paid app since adobe is distributed for free on the internet??? This is kinda abusive in my opinion and if you are not the same guys from the Adobe there's no reason to charge for a free app. its just a trial if you dont buy it. If you haven't tried it, please do not post comments. how i can purchase adobe reader on cash payment .It is one of the best mobile application.